The convergence of two significant and revolutionary technological developments in the petrochemical industry -- crude oil-to-chemicals (COTC) and oxidative coupling of methane (OCM) -- are poised to have a very significant impact on the chemical industry, according to new analysis from IHS Markit (Nasdaq: INFO), the leading global source of critical information and insight. This analysis from Don Bari, vice president of chemical technology at IHS Markit, follows on an announcement made earlier today by Siluria Technologies, which has joined forces with Saudi Aramco Technologies: Siluria Technologies and Saudi Aramco Technologies Company join forces to maximize chemical production. One of the most significantly disruptive technologies or categories of technologies being developed, based on their sheer volume, is crude oil-to-chemicals. These projects, in effect, merge a refinery and petrochemical plant into one, and thus, go well beyond the state-of-the-art refinery petrochemical integration by the implementation of new/reconfiguring unit operations into a refinery. Upgrades a lower-value stream into a higher-value product through greater operational efficiency and optimization of assets. Greater capital efficiency--leverages a well-integrated upstream (refinery) with the downstream (chemicals) operations to increase efficiency of deployed capital (maximum investment-per-ton of production capacity) through scale; and decreases operating costs through carbon efficiency and low fixed operating costs. (In a Reuters News article published Jan. 18, 2018, Aramco chief technology officer Ahmad Al-Khowaiter said the process called thermal crude-to-chemicals technology “would cut capital costs by 30 percent compared to conventional refining.”). Sustainability gains through the reduction in the overall carbon footprint of a facility due to integration and optimization of assets, which become more efficient. The global demand for ethylene and propylene are 160 million metric tons (MMT) and 111 MMT per year, respectively, and at approximately 4 percent annual growth rate, the required global annual capacity additions would be 6.4 MMT and 4.4 MMT of ethylene and propylene, respectively. These volumes could nearly be supplied from two large-scale 200,000 barrel-per-day COTC complexes (see analysis below and note that multiple FCCs, cracking furnaces and cracked gas compressor/separation trains would be required); instead of four conventional state-of-the-art naphtha-cracking light olefins plants. If multiple COTC facilities are eventually built, the export dynamics would, over time, change significantly and put pressure on olefin and feedstock-related derivative exports from the U.S. According to our IHS Markit estimates, U.S. exports of these olefin and feedstock-related derivatives will reach approximately 14 MMT by 2020. Siluria Technologies: Addressing sustainability through carbon efficiency—A new operational metric? 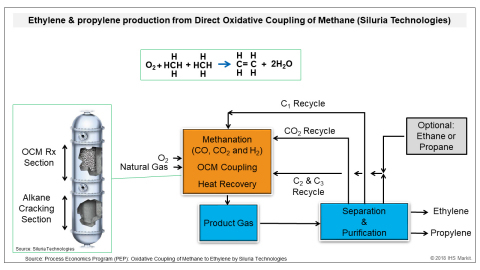 Siluria Technologies’ oxidative coupling of methane to ethylene (and propylene) process converts methane to olefins in the presence of a catalyst in an oxygen-rich environment. The catalyst reaction “diverts” roughly half of the carbon to the undesirable co-products of carbon monoxide (CO) or carbon dioxide (CO2). In this highly exothermic (heat generating) reaction. Siluria exploits this exotherm by injecting ethane or propane into a second reaction chamber, where the light alkane is thermally cracked to the olefin. Moreover, to enhance the overall carbon efficiency of the process, a catalytic methanation step is embodied in Siluria’s process. This reaction converts all generated CO and a portion of the CO2 oxidative coupling reaction co-product back to methane by using the hydrogen generated in both the OCM and the ethane/propane-cracking reaction in the post-OCM section of the reactor. In fact, the Siluria process design philosophy is all about less total carbon (methane) consumed per unit of light olefins produced, because the process is “indifferent” to methane as a feedstock, or as energy (process utility). Therefore, one would expect that a design philosophy that equates British thermal units (BTU) of energy savings to a reactor-conversion-per-pass percent increase should drive that most optimum overall process design. The Siluria OCM process also delivers significant reduction in carbon emissions over traditional ethylene production processes. IHS Markit evaluation of total carbon dioxide emissions to the production of ethylene by various feedstock types shows that the Siluria technology is expected to be a net-negative CO2 producer per ton of ethylene/olefins produced because of the heat generation for the OCM exotherm, and methane production (partly) from CO2 is considered in our methodology as an offset to CO2 emissions. IHS Markit estimates that the Siluria Technologies OCM process generates negative 1 ton of carbon dioxide emissions equivalents per ton of ethylene produced as compared to the more conventional naphtha-cracking process for converting crude to olefins, which is estimated at greater than 1.4 tons of CO2 produced per ton of ethylene produced. This is a significant improvement in carbon emission reduction, while at the same time capturing greater value from the molecules. How can Siluria Technologies add to the impact of crude oil-to-chemicals mega complexes? Independent and detailed technical analysis by IHS Markit of a Saudi Aramco-type COTC approach (as described in Saudi Aramco’s patent literature) projects that crude oil feedstock will be converted to chemicals at a higher intensity than conventional processes, increasing the yields of crude oil feedstocks converted to chemicals to 72 percent. (Note that a January 18, 2018 Saudi Aramco announcement by Reuters states that it expects, with its developing COTC technology, “70 percent to 80 percent of the crude intake will be converted into chemicals….”). With the recent cooperation announcement by Siluria Technologies and Saudi Aramco Technologies Company to work together in the COTC process to maximize the production of chemicals from a barrel of oil, IHS Markit speculates that if the methane off-gas and a portion of the ethane in a hydrocracked Arab Light crude oil feedstock were to be fed to the Siluria OCM technology, then a net increase of 300 thousand metric tons (TMT) to 350 TMT of ethylene and 200 TMT to 250 TMT per-year of propylene, would be generated (based on 10 million metric tons (MMT) per year (200,000 barrels per day) of crude feed). With methane valued at U.S. $1.25 per MMBTU in the Middle East, the Siluria OCM technology appears to be an attractive approach to enhance the value of a barrel of oil. The oxidative coupling of methane (OCM) to ethylene has attracted significant attention since its discovery in the early 1980’s. Compelling efforts to produce ethylene directly from natural gas have been made, yet no OCM process has been commissioned at commercial scale. The two major companies that tried to commercialize OCM, ARCO and Union Carbide, did extensive catalyst screening studies in the 1980’s and early 1990’s. ARCO reviewed several transition metal oxides as oxidative coupling catalysts. Manganese oxide catalysts on silica support where found to be the most attractive for methane conversion to ethylene. However, high-product yields required operating temperatures above 800°C. Higher operating temperatures led to methyl radicals forming higher-carbon number products, and undesirable products (CO, CO2, and coke) formed. A similar conclusion was reached by Union Carbide. The Union Carbide research showed that the development of more active (and selective) catalysts potentially operating in the 400°C to 600°C range might permit industrial operation. Although those catalysts showed promising yield and selectivities, they were significantly hampered by long-term catalyst stability issues, largely due to the required high-reactor inlet temperatures. Siluria has developed and scaled-up a proprietary commercial, low-temperature OCM catalyst that can operate adiabatically with fewer stages at several hundred degrees °C lower inlet temperatures, and at higher pressures. This catalyst produces a favorable yield and has a standard lifetime for a commercialized process; and it has a relatively high-space velocity. According to U.S. provisional patent applications, Siluria’s proprietary catalyst is based upon mixed-metal oxide nanowires. The heart of Siluria’s process technology is a two-stage adiabatic reactor. Within the reactor, heat recovery is a significant technology feature, where the exothermic heat from OCM is used to thermally crack the by-product and fresh ethane and propane to ethylene and or propylene. As previously mentioned, a methanation step is employed to convert co-product CO, CO2 and H2 back to methane, and to enhance overall carbon and energy efficiency of the process. To enhance the overall carbon efficiency of the process, a catalytic methanation step is included in Siluria’s process. This reaction converts all generated CO, and a portion of the CO2 OCM, back to methane by using the hydrogen generated in both the OCM and ethane-propane cracking-reaction sections of the post-OCM section of the reactor. The product gas from the OCM reactor moves downstream to the generally conventional olefins cracking separation, recovery and fractionation steps. However, Siluria has developed proprietary separation and recovery technology, including optimizing system hydraulics, thermodynamics (pressures and temperatures) and heat integration, to minimize energy consumption. This is especially necessary given that the methane-per-pass-conversion is relatively low due to the thermodynamic limitations of the OCM adiabatic-reaction design. The low methane-conversion-per-pass means that a large amount of methane must be recompressed and cryogenically cooled at great capital and energy expense, to recover the olefin products. In short, the intersection of a global hydrocarbon resource powerhouse such as Saudi Aramco, with Siluria Technologies, a small, but innovative, process-technology company, is expected to yield significant returns for both entities, but also drive the industry forward in process improvements, greater carbon efficiency, capital efficiency and value creation. While these technologies are capitally intensive, the commercial application of these two revolutionary technologies not only enables greater carbon efficiency, flexibility and value to the petrochemical producers, but also a significant route to greater carbon emission reduction, which has an untold value to chemical producers and to the sustainability of the industry. This sustainability value will likely only continue to increase as more consumers, investors and regulators seek greater environmental stewardship from petrochemical producers. For more information on the Siluria Technologies OCM process, the crude oil-to-chemicals technologies, the IHS Markit Process Economics Programs (PEP) covering these and other disruptive technologies, or to speak with Don Bari, please contact: [email protected].